The physicist Albert Einstein reputedly said that if he had one hour to solve a problem on which his life depended, he would spend 55 minutes studying and defining it, and 5 minutes solving it. Often, a client (or, your manager or a colleague) presents a problem they need to be solved, but the problem is defined incorrectly or too narrowly. Sometimes, you need to work with your client to reframe the problem. One client asked me to help them reorganize their company, but the real issue lay in the poor definition of roles and responsibilities. Another wanted a culture study done, but the real issue was a lack of a coherent strategy and shrinking market share. Even if the problem is described accurately, the best solution may be broader and more holistic than the client envisioned. Which key strategic priorities does this support right now? What needs to be done to ensure this is seen as aligning with your most important, enterprise-wide initiatives? Can you tell me more about the overall context for this program? Why now? 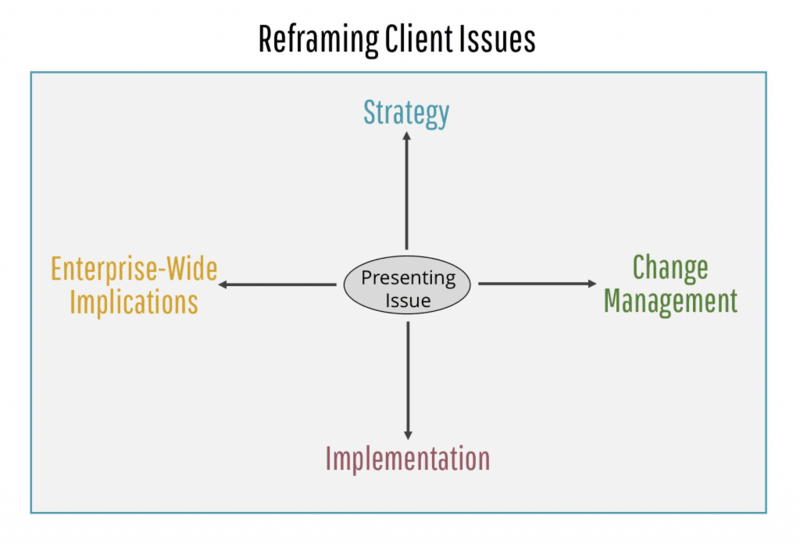 By reframing into Strategy, you connect your specific project to the organization’s higher-level strategies and goals. You will ultimately then design a more complete engagement that has a high degree of fit with the strategy. Who is responsible for the eventual implementation of this? Have you established measures of success? How will you know it’s working? In the past, what have you done to ensure a solution like this gets used and implemented properly? From your perspective, what are the implementation risks? How can they be mitigated? Third, you can reframe across the Enterprise. There are vast interdependencies in any complex organization, but middle managers are often in silos where their point of view is local and their compensation rewards them for success in their particular pond. Yet, if you do something for HR or Finance or Operations, it will inevitably have knock-on effects across into other functions and business areas. One of my clients discovered this when they implemented a new CRM (customer relationship management) system. To work effectively, it required changes in behavior across many different parts of the organization, not just from the salesforce. As a result it took nearly a year longer than expected to make it fully functional. To surface these enterprise-wide interdependencies, you have to ask a lot of questions about how your solution or product will interact with other functions and business units. The first three strategies take you up, down, and across the organization. The fourth strategy makes you take a Change Management or “process” perspective around any major new intervention, product, or solution. This is an additional area to explore with your client that will inform and possibly enlarge the scope of what you do. Stakeholder alignment and management.Who are the key stakeholders, from within the area you’re working, but also from other parts of the company? How should this group be communicated to and managed? How can you ensure their continued support? Technology and systems. This is a hugely important and complex area–many corporations invest well over $1 billion a year on IT. You may know little about technology and information systems, but it behooves you to ask some basic questions and ensure your client’s systems will support, not obstruct, your solution. Management process. This comprises the decision-making protocols, supporting systems, and other processes that help you manage the area you are working in. For a client of mine who wanted to create an account management structure, this was a big problem. The new structure was going to be toothless because the decision-making authority and information flows about client relationships were going to remain firmly with the traditional geographic heads. People and skills. This is one of the primary concerns of leaders—building talent across the organization—but not always of middle management who are more focused on their individual contribution. You should ask: What are the implications of our work for the people and skills the client will need, today and in the future? Organization roles and responsibilities. Questions you might ask include: Do your current organizational roles support an initiative like this? Are you considering changes in your roles and responsibilities, either to better enable the success of this program or for other reasons? The next time your client—or someone you work with—presents a problem or challenge, use this simple four-direction framework to make sure the problem is defined in the most effective way.